Crystal Group’s Mechanical & Electrical Engineering services help bring critical projects to fruition, working hand-in-hand with customers to ensure requirements are met. Crystal Group’s mechanical and electrical engineering team specializes in the design, test, and development of highly reliable electronics and computing hardware – from printed circuit boards (PCBs) to backplanes, power supplies, and more. Mechanical engineers and designers accurately model and develop 3D designs with AutoCad Inventor®, building new structures, using existing components from previous designs, performing checks, and analyzing tolerances quickly and effectively. Engineers perform thermal analysis using in-house thermal imaging and chamber equipment, or Flotherm® externally. Electrical engineers and designers generate block diagrams using Microsoft Visio, and accomplish schematic capture and board layout with Altium® PCB design software. 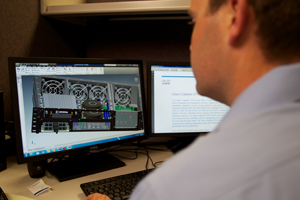 High-tech and high-level personnel, from the surface-mounted device (SMD) assembly technician to the vice president of operations, perform design reviews prior to ordering printed wiring boards to ensure a functional, producible circuit board design. Contact Crystal Group’s helpful and knowledgeable staff for Mechanical & Electrical Engineering services, a quote, or more information.